We provide all linen and towels as well as starter packs of tea, coffee and sugar. All rooms are heated. 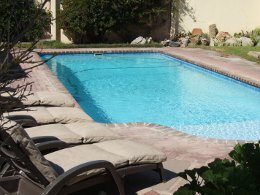 We have a sparkling pool that is open from October to April. All guests are welcome to use it - free of charge - from 9 in the morning until 6 at night. 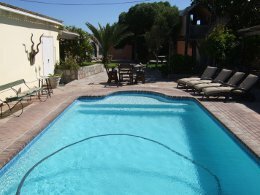 The pool area has a braai (barbeque) with fridge, umbrellas and comfortable pool loungers. Internet and other business facilities are available at a charge. Ironing can be done at an additional R7.00 per item. Daily housekeeping service provided for self-catering cottages (except for Sundays and Public Holidays). B&B rooms are serviced every day. 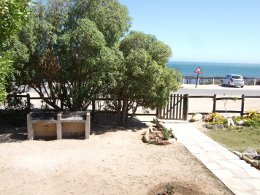 All cottages have an outside braai (barbeque) area. A security officer ensures the safety of all parked vehicles at night. However, while every precaution is taken to ensure your safety and that of possessions, it is an express condition of your occupation/visit, to any portion of these premises, that the owner and staff of Bedrock Lodge are not responsible for any loss or damage to the property (this includes vehicles) of any guest or visitor brought upon the premises, regardless of the cause. 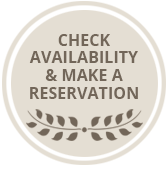 It is available to our self-catering guests at an additional R70 per person. Breakfast is included for our in-house guests. Guests can choose to have a take-away lunch pack instead.